May 12, 2010 - On Friday, May 7, 2010, about 10:06 AM Pacific daylight time, a Cessna T206H, N663HP, collided with mountainous terrain in the Anza-Borrego Desert State Park, Borrego Springs, California. The airplane was operated by the California Highway Patrol as a public-use surveillance aircraft. The commercial pilot, Officer Danny Benavides, 39, was killed, and the airplane was substantially damaged and consumed by a post accident fire. Visual meteorological conditions prevailed, and a company flight plan had been filed. The flight originated at Thermal, California, about 7:15 AM. Benavides was the only parson on board at the time of the crash. Representatives of the California Highway Patrol (CHP) stated that between 8:30 AM and 9:20 AM the airplane was performing traffic surveillance activities with numerous CHP ground units in the vicinity of SR86 and Hoskins Street, 21 miles north of El Centro. The CHP officers decided to transfer their activities to I-8 and Dunaway Road, 14 miles west of El Centro. 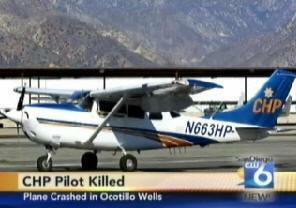 The CHP officers reported that by 10:00 the airplane pilot had not checked in with them. At 10:06 AM, the dispatch operator for the California Department of Parks and Recreation received a call that someone saw smoke in the vicinity of Split Mountain (Anza-Borrego). About 4 PM the wreckage of the CHP airplane was located on the east face of mountainous terrain, 2 miles north of Split Mountain. Naval Air Field El Centro, located 30 miles southeast of the accident location, reported weather conditions at 9:56 AM as clear sky, winds 010 degrees at 5 knots, and 10 miles visibility. Benavides was a 13-year patrol officer with the California Highway Patrol. The NTSB released it preliminary report on Monday however, the report did not reveal the cause of the accident.